This August 12 - 16, will be the second tour for Raz Bin Sam of New Zealand's South Island this year. His June tour there was a success & as result plans were made for a second tour. The June tour was with Selector Wade (Dasvibes) but this time round Raz is going as a guest on Dubwise Soundsystem alongside David 'Snypa' Levi & Messenjah. Raz Bin Sam - Own This Life out NOW! All shows are a 10pm start & are 8/10 on the door. Blaze It Higher! Bless up Raz Bin Sam, Looking 4wd to this Mashup..
Hey Raz! Man you better be blazin some fire that time of year on the Sth Island.Your going to feel that it's a little bit chilly.Well a lot more chilly than Byron. Take these fire starters with you bro. Well that's chur from me for now.Or should that be Brrrrr! 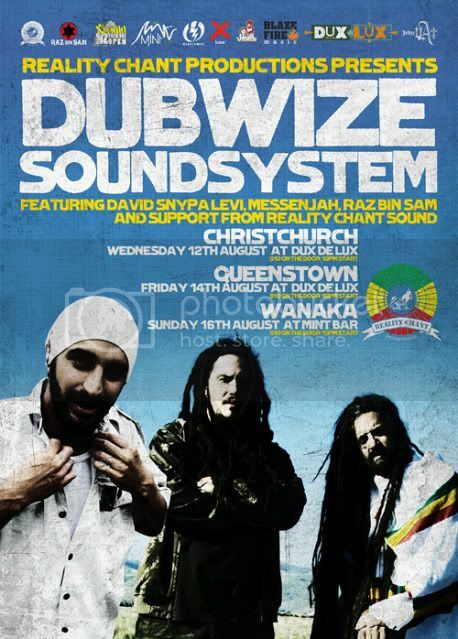 Reality Chant Productions proudly presents the Dubwize Soundsystem South Island Tour '09, featuring Messenjah, David Snypa Levi and very special guest, direct from Australia, Raz Bin Sam! Renowned throughout Australasia for their dynamic live sets and pioneering albums, To The Control Tower, Reality Chant and Snypa Levi - The Sojourner, Dubwize have been trail-blazers of the scene for over ten years, representing at major festivals, keeping the tour-circuit fresh and producing riddims that have helped to define the contemporary Aotearoa reggae landscape. They continue to forward the vibes in 2009 with unique collaborations and an ever-growing selection of original beats! Joining them is Raz Bin Sam, a Jewish reggae artist with a dynamic style and sound. Based in Australia, Bin Sam is a part of Blaze Fire Sound and five-piece reggae band, Lion I. After being signed in 2007 to major German label, Das Vibes Records, he has gone on to release his fourth solo album, Own This Life, in May 2009, from which he will showcase material when he touches down this August! Also featuring support from Reality Chant Sound, this tour brings together the best of local and international reggae music for three nights of blazing reggae and dancehall - do not miss! this should be well wicked!